While Kropf.com is primarily a Hosting provider, we have strong relationships with numerous professional Web Site Design Studios that that are experienced in sites ranging from single day designs, to large scale world class database driven interactive sites! Many businesses delay starting an Internet presence for fear of needing an elaborate, multi-thousand dollar site that would require many hours of planning and collaboration. For the typical small business, this is absolutely not necessary. For businesses new to the Internet, we offer you a simple one-page "Brochure" (or "Business Card") web site design that is included in a one-time fee of $49.00. The "Brochure Site" should provide a few paragraphs of text describing your business. You may already have a paper brochure with this information. We immediately submit your brochure site to the top 80% of search engines to start the index process of making your information available to customers around the world. A key point to remember in branching out into the vast Internet world of e-Business is that your customer territories are much more vast than conventional "brick and mortar" businesses. It's just as easy for a customer across the country, or even the world, to find your indexed web site as it is for a customer in your local area. 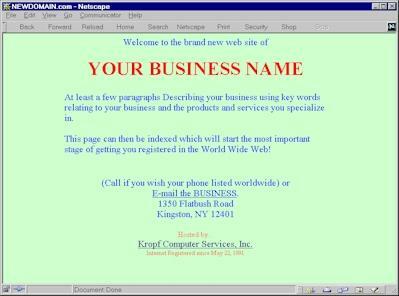 While it takes up to two months for the Internet Search indexes to get updated, you may wish to work with a design team to further enhance your web site by including graphics and possibly even elaborate features such as Dynamic pages with Server Side Includes, data entry forms, databases, and FlashTM / ShockwaveTM type effects, making it an attractive "Interactive Web Site". Kropf can refer you to professional designers that we work with to design beautiful and functional sites as in the examples above that are currently hosted by Kropf.com. Keep in mind, your web site works 24 hours a day, 7 days a week to answer your customer's questions about your business and products, and can even be designed to take orders 'round the clock'! Click on the different images to see samples of the various type of Web-sites, but remember the smart way to start is with the "Brochure Site" that can start the Search Engine Index process ASAP. You could then build your site from there as your time and resources permit. Every day that you delay your start is another day of advancement for your competition! So, whatever your budget or time frame is, start the site that gives you a presence on the World Wide Web by clicking on this link to fill in the contact form. With our help, you can be on the Web in almost no time! Contact Kropf.com to start the design or professional update of YOUR Internet presence!